Nearly three weeks since Hurricane Maria destroyed everything in its path, the island of Puerto Rico and its people seem trapped in another period. With power still out, food and gasoline scarce, banks not working normally, and not enough aid and supplies coming in, “hope seems nearly gone,” said president of the Seventh-day Adventist Church in Inter-America Israel Leito after a two-day visit to the island. It will take time to get the Church into the same condition it was before the hurricane, said Leito. During his two-day visit to the island in early October, he met with Church leaders in the capital city of San Juan, visited the Church’s two major institutions and encouraged church members displaced by the storm. Leito’s visit brought needed supplies and several satellite phones for church leaders to use as communication has been hampered across the island since the storm hit on Sep. 20. 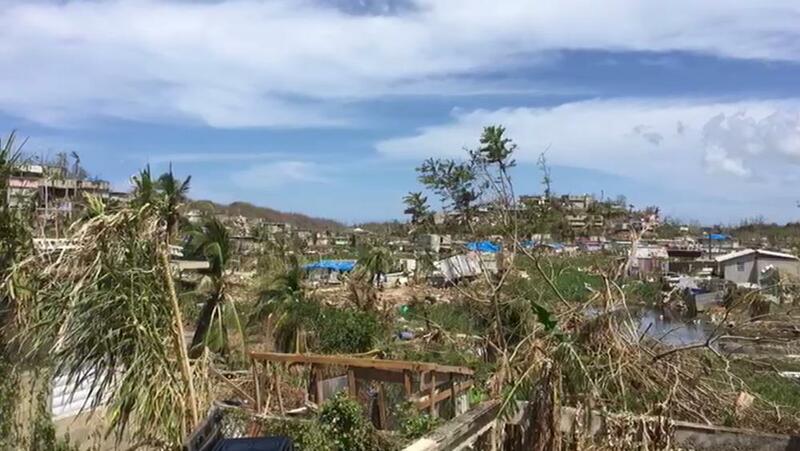 Local church leaders in San Juan reported that many of local churches across the island are doing their best to provide the little food and water they have to help members and those in the community, said Leito. For example, members of the Adventist Church in Toa Baja, a church still unfit to worship in, are meeting outside every Sabbath to worship and offer warm food to the neighborhood, said Leito. Leito urged church leaders to continue encouraging churches to share hope and a warm meal every Sabbath for every member and person in the community. During his visit, Leito was able to visit with church members staying at a shelter in Isabela, in the western part of Puerto Rico. “I prayed with them and encouraged them and told them that help was on the way,” said Leito. Seeing them in a shelter like that was concerning to Leito. “Our local church leaders are doing all they can to find another option for members,” he said. “God is opening the doors in the midst of a national crisis,” said president of the church in Puerto Rico Jose Alberto Rodríguez. 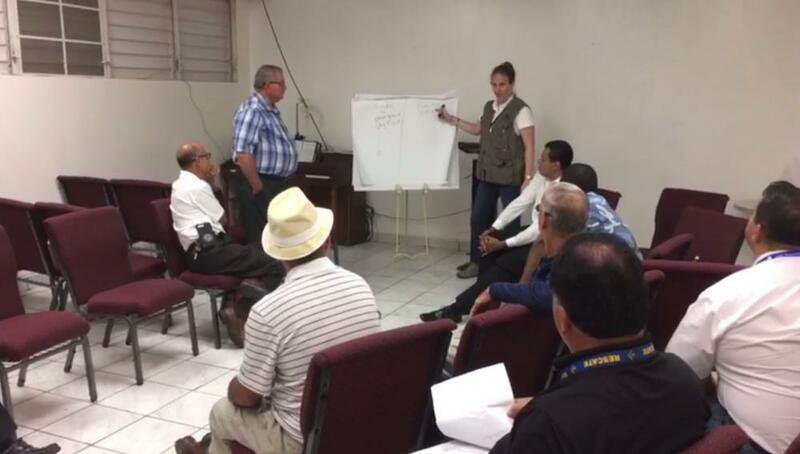 While the church’s two radio stations have been down since the storm hit, regional leaders meet every other day in San Juan, the capital city, to go over reports, church needs, church activity and plans to share with the membership. “We face so many challenges with so many of our pastors and our members who have had their homes destroyed, yet we praise the Lord for His watch over us,” said Rodriguez. In the meantime, the Inter-American Division (IAD) has been providing emergency response funds to assist the church membership across the island. Also, the Church sent an initial air shipment of water, food and relief supplies last week to assist while logistics in aid distribution across the ports and airports are still being worked out on the island. Additionally, the Adventist Development and Relief Agency (ADRA) has sent an emergency response director to assist in assessment and coordination of relief efforts with local volunteers to assist the thousands of people affected. Top church leaders in Puerto Rico are leaving it up to local leaders across the four conferences and missions to take care of their members as well as primary and secondary schools as best as they can while the union administration oversees the two major church institutions: the hospital and university. 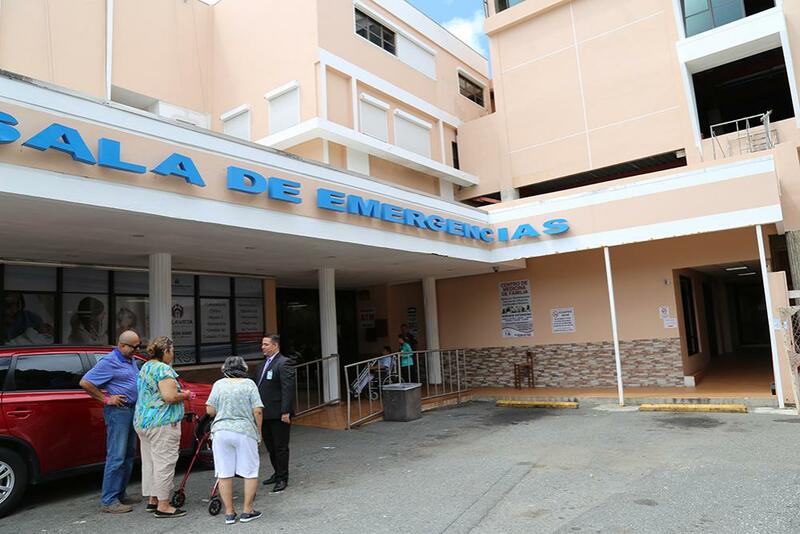 The church’s health care institution, Bella Vista Hospital, has been continuing operation with its three generators, one of which has been failing, said Leito after visiting with hospital administrators and staff. “They are in need of another generator and funds to keep those generators running with fuel, which is becoming a major expense at the moment,” he said. IAD and General Conference leaders have come together for special financial assistance to help keep the hospital functioning in the short-term, said Leito. “Bella Vista Hospital has been proving services to the community for more than 60 years, and we must keep the institution going with enough support to continue its ministry of providing health care,” he said. The IAD has located a used state-of-the-art generator for the hospital with the help of Loma Linda University, which will be covering the shipment of the generator to Bella Vista Hospital. The hospital’s cafeteria is only providing food for its patients and essential medical staff at this time, reported Leito. 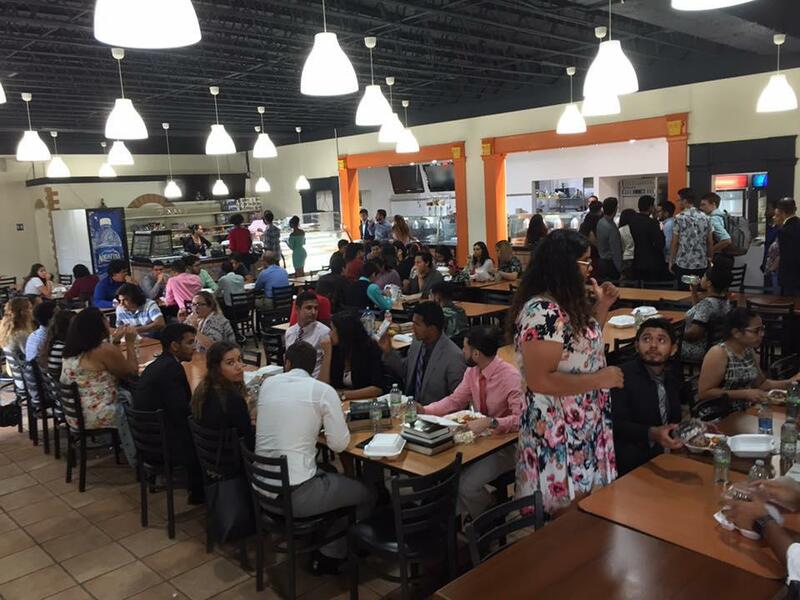 Antillean Adventist University, the Adventist school in Mayaguez, has been taking care of more than 200 international students since the storm affected its class schedule nearly three weeks ago. Yet one of the major issues is enough water to run the institution every day, according to Leito of his visit. “The IAD is helping the university to build a new well that can hold about 50,000 gallons of water every day,” said Leito. Since the storm, the university has been operating with some 30,000 gallons of water every day, according to Antillean Adventist University president Obed Jiménez. “The well will help our water supply infrastructure on campus as our students resume classes,” said Jiménez. In the meantime, the university is obtaining water for the campus. The well should be completed once engineers begin the digging operation, he added. Students have been assisting in the community near the campus, bringing cheer and clearing small debris from the storm, university officials said. The faculty and staff have cleaned and prepared the school to resume classes today. Jimenez has been answering questions through live sessions on the institution’s Facebook page. With more than 2,000 people on campus on any given day, it is important to get the school fully functioning, as before the storm, said Jiménez. He shared that the institution is needing additional generators for the library and technology department as the authorities have announced that power may take longer to restore in the area. Jiménez said that the institution has never had to suspend classes during the school year as it did after Hurricane Maria. The institution closed in 1928 when it moved to Cuba for some years and later transferred back to Mayaguez in the 1950s. Leito reassured local administrators and leaders that it would continue to oversee the institutions the church operates there in Puerto Rico. “We are trying to ensure that our university keeps functional even under the circumstances, and hope that international students choose to stay,” Leito said.